The situation the world now faces with North Korea has been long in coming. Its latest nuclear and missile tests, and the war of words between Kim Jong Un and Donald Trump, have seemingly brought the world to its most dangerous point yet in the standoff with North Korea. Or maybe not. In the early 1990s, North Korea’s nuclear ambitions threatened to erupt in crisis. Atomic inspectors were closing in, leading Kim Il Sung in 1993 to threaten withdrawal from the Nuclear Non-Proliferation Treaty (NPT). Eventually, he negotiated with the US and the result was the Geneva Agreed Framework in 1994, months after Kim Jong Il came to power. It was meant to halt Pyongyang’s path to nuclear weapons, and for the most part it worked. Until it didn’t. Accused by the US of cheating on the deal, North Korea formally withdrew from the NPT in 2003. From there, the Six-Party Talks sought once again a negotiated end, while back-to-back liberal South Korean governments sought engagement through the Sunshine Policy. Nevertheless, in 2006, Pyongyang tested its first nuclear device and in 2009 pulled out of the Six-Party Talks, angered by criticism of a failed satellite launch. Since 2011, Kim Jong Un has accelerated North Korea along a collision path with the US and its allies: four of its six nuclear tests have been under his watch, the latest and largest on Sept. 3. Its ballistic-missile program has also made unexpected progress, with its ICBMs now perhaps just a year from being able to reach the US mainland. Just as alarming, US politicians are now talking of military options and the public discussing war scenarios. Meanwhile, many in Asia, including South Koreans, do not seem to fully grasp the gravity of the situation today. For our cover package, we assembled some of the world’s foremost experts to analyze where things stand and how to find a path forward. With guest editor Peter Hayes, director of the Nautilus Institute and an editorial board member of Global Asia, we look at Pyongyang’s actual nuclear and missile capabilities and how they advanced so rapidly; whether it’s time to recognize North Korea as a nuclear power and learn to live with it; Kim Jong Un’s personal and psychological history; the risks posed by US President Trump’s transactional approach; the spectrum of potential solutions — including negotiation, sanctions and even military options; the illusion of North Korea as a monolithic state; the logic of re-stationing US tactical nuclear weapons in South Korea; and the possibility or desirability of regime change. 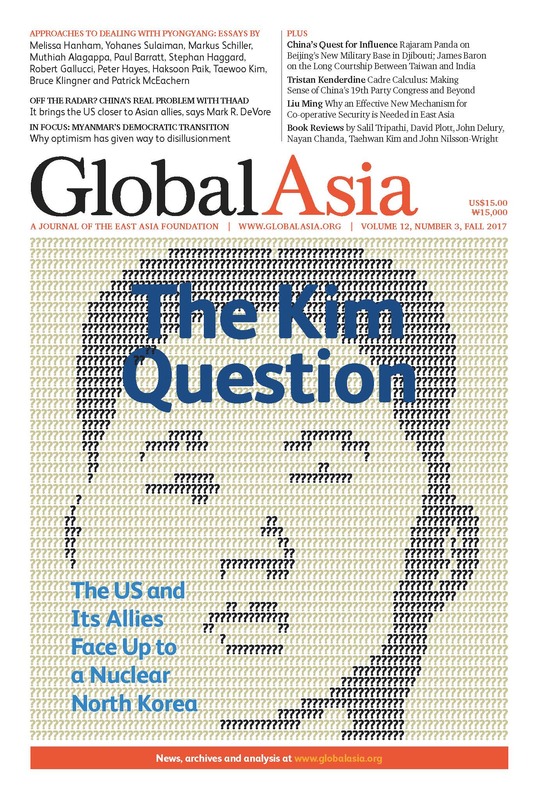 In our Features pages, we look at what’s really behind China’s concerns at the rollout in South Korea of a US missile-defense system; why China’s first overseas military base, in Djibouti, is causing upset in New Delhi and elsewhere; the meaning of Taiwan and India’s courtship; what is at stake in the leadership stakes at China’s upcoming 19th Party Congress; and why Northeast Asia needs a new security mechanism — one with teeth. Our In Focus section is devoted to Myanmar, where we lay out how civil-military relations reveal the move toward democracy as largely a disappointing illusion, for now; and how Aung San Suu Kyi could have done much more than she has. We also look at how the miserable plight of the Rohingya might be addressed under the right circumstances, although that isn’t likely. And, as always, we feature reviews of some of the most engaging recent books on Asia. Under Kim Jong Un, North Korea has achieved a level of nuclear and missile development that has finally caught the eye of Washington and the American public. Is peace still possible? The test on Sept. 3 should not have been a surprise - and more nuclear and missile tests can be expected. Efforts to stop Pyongyang's nuclear program have failed. It's time for the West to accept that and to manage the consequences. Has North Korea had significant and ongoing assistance from outside? All sides must recognize that the key issue is resolving the painful division of the two Koreas. The US president's transactional approach to diplomacy holds serious risks. Questions of Deterrence: Can Sanctions Work Against North Korea? They can be part of a narrow path to denuclearization only if coupled with negotiations. Why Not Negotiate With North Korea? Doesn't the real threat of war on the Korean Peninsula make it pertinent to ask why negotiation shouldn't remain an option? Trump and Kim's war of words risks triggering a real war. What are the military options on both sides? Understanding the young leader's mindset, psychology and achievements is a vital starting point for finding a path toward a solution to the current crisis. For Seoul, North Korea as a nuclear-weapons state is particularly perilous. The options are both risky and far from simple. There are those in the elite who believe a different path should be pursued, if the conditions are right. China's outcry at South Korea's welcome for a US missile-defense system is because it will bring America much closer to its regional allies. The move has set off alarm bells, confirming suspicions that Beijing is intent on containing India’s influence. Indian rivalry with China for influence in Asia goes far back: witness its complex engagement with what China sees as a renegade province. President Xi Jinping has been maneuvering for months to strengthen his position, but many scenarios could play out. After all, it is the main venue where the US and China lock horns for influence. Its transition to democracy began with optimism but lately has generated its share of disillusionment. Only addressing tensions can bring peace. 1987: Singapore’s Marxist Conspiracy 30 Years On is an attempt to make sense of a dark chapter. Michael Vatikiotis's Blood and Silk: Power and Conflict in Modern Southeast Asia laments the failure of the region's nations to live up to their promise. Abbas Amanat's Iran: A Modern History is an ambitious, vivid account with rich literary flavor. A selection of 11 new titles of interest on Asia.